I am surprised that he is using mechanical relays in a 4 wheel drive vehicle. The jarring could cause the relays to fail. SS relays would be a better choice and last longer. Also it would be easy to jump start the Jeep by bypassing the computer and without a steering lock (yes I know it can be easily defeated). All in all a great project that will get better with time! Thanks for clarifying. I figured it was a mash-up of Jeep and Uterus. Good job interfacing with your Car’s hardware. Nice build. But C’MON! Voice activated human interface! This is one more upgrade away from being Star-trek computer potential. No push buttons and scrolling. Not to mention the whole hands-free == safer driving aspect. 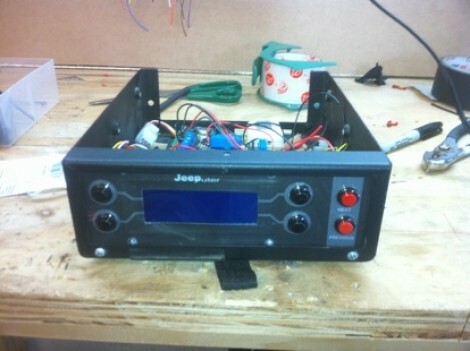 My Jeep had a similar feature, except instead of a Jeeputer I had a switches, except for the fog lights, which required opening the hood and wrapping a wire around the battery post. Cool project though. you have some crazy ways of adding things to your life. like your kitchen soda machine. not sure if i would ever put that ugly of a thing into my kitchen…. I hate me some arduino, but you have to be a whole different sort of moron to give it any control whatsoever over your vehicle while in motion. It would be an improvement, but I’m still not driving it. Nice build, but I think I have to agree with nonermouse. Mechanical relays have been used since CJ’s at LEAST, and guess what? A lot of them are still going strong. My 93 still has no issues with any of my relays and they’re used for main system components. Also, this guy maybe a mall crawler more than anything. When he means steering wheel lock, He is correct. The steering wheel locks (if a manual Trans) so somebody cannot just push/tow your car away from a parking lot, without elevating the front wheels. So one can also hotwire the jeep and get the ignition on, but will not be able to turn the wheel without unlocking steering wheel. And in Jeeps columns you cannot just break the key hole, a rod is jammed into the steering wheel and does not allow the steering column to spin, unless the pin is manually removed which can only be accomplished with the key-ignition switch. And nice hack but too complicated for me, but nice! The difficult part is figuring out where on the column the lock actually is. And then, getting to it is usually quite difficult. Mine seems to be built into the key column assembly which is, of course, bolted around the column itself. I COULD just snap it right off and keep the ignition switch wiring intact, but I’d like to keep the key-based functionality in case things go wrong. One way I came up with to easily disable steering-wheel lock in a reversible way is to, permanently leave a key in the ignition, but un-plug the electrical switching portion of it. To make it no so obvious, you could grind off most of the key head and then make a plastic or rubber cover that goes over it, so the ignition just looks blanked out. Obviously if someone is keen, they can plug your ignition switch back in and steal your car, but you could take measures to make that not so simple. Anyway, I had considered that when I wanted to do push-button ignition on my 3000GT, but I never got around to it! This jeep looks new enough that all of the body functions (ignition, headlights, everything) are controlled by the BCM. All of these tasks could be completed by simply providing the BCM with the proper commands. Using all of these relays and messy wiring is completely unneccesary! If this involved interfacing with the on-board chrysler BCM, it could be called a “hack”. In its current state, it’s just a reeeeeeallllly time consuming project. So interfacing with a pre-installed component is considered a hack to you, yet installing everything manually/building a project from the ground up with micro controllers, LCDs, LEDs, switches etc… Isn’t? Me thinks you need to look up the definition of hacking. This is a hack, moreso than just interfacing with an OEM part. A quick solution (relative) is to remove your steering wheel, and watch for your solid rod. This rod usually fits into a sproketed ring. If you can remove this ring or even the rod and spring assembly then reattach wheel )as well as all bolts and wires for horn and what nots. But if you can do what you were claiming with the screen and all then this shouldn’t be too hard just more mechanical and less code. B.) With out the steering wheel lock the car is not safe to park on a hill. Remember, you need to turn your wheels into the curb. The wheel need to lock. Nice build. All that wiring integration is the kind of stuff that gives me nightmares. I don’t even like tapping 12V in my car, it’s so much work getting at anything behind the dash. Props for dedication. This is (one reason) why your shift registers have an async reset pin. Pull it low with a resistor, and connect to the AVR (you can gang them all together). The AVR’s outputs start in high-Z mode, so the register’s outputs will remain low until you lift the reset in your code (after loading proper values). You obviously have no idea what I am talking about. Such an interface would require a good deal of design work/reverse engineering (say, sniffing with a logic analyzer, etc) as there is very little documentation out there on doing such a thing. The neat thing would be that if someone designed such an interface, that interface would apply to many chrysler vehicles. Then, a bunch of other people who read HaD could copy it verbatim and call it their own work! @Jake – I’m sure there must be such interfaces for Chryslers. I know for BMWs certainly the iBus was well exploited – there was a guy making USB and Serial to iBus interfaces, which you could control pretty much anything over. Ah fascinating! find out something new every single day.